Every buyer has them. You know, the “must have” list. Since people started buying homes there has been one. The problem now? The “must have” list is out of control. What do I mean by out of control? Well when people used to look for their first home, their “wish list” often consisted of a home with 2 or 3 bedrooms, a bath or two and a particular size piece of property. If it was in good shape, great! But it wasn’t expected to be perfect and top of the line. The expectation used to be that you would move in and start to do small projects to update or make the space your own. With the advent of networks on cable like HGTV and DIY Network, the expectations of home buyers has been jettisoned to the sometimes ridiculous. Just turn on a show like HGTV’s House Hunters and listen to what new home buyers expect to find in their first home. 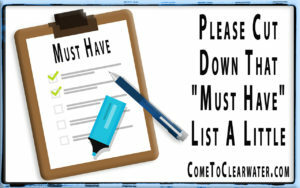 The typical “must have” list now includes things like granite counters in kitchens and baths, top of the line appliances, open concept with no beams, hardwood floors, en suites, upscale laundry rooms, outdoor entertainment space, huge closets and more rooms than a couple could need even if they had a child or two. There are probably a lot of reasons why this expectation of living is part of the new home buyer’s demands, but some of it can be directly traced back to home networks. They make it look normal to have those amenities. In reality most homes don’t have those top of the line amenities. It takes a lot of money to add them and the average homeowner needs to be more worried with systems, roofs and making mortgage payments! So, first time home buyer, lower your standards! Make your “wish list” within reason and you will find that home that fits you at a price you can afford.